This recipe is originally from the Aug 2010 issue of Southern Living. I adapted it slightly by using a premade pizza crust, and I baked it instead of grilling it. You can find the original recipe here if you would like to try it grilled. Also, I made an individual size pizza, but you can always make a larger version, you just need to add more toppings. It was surprisingly delicious! 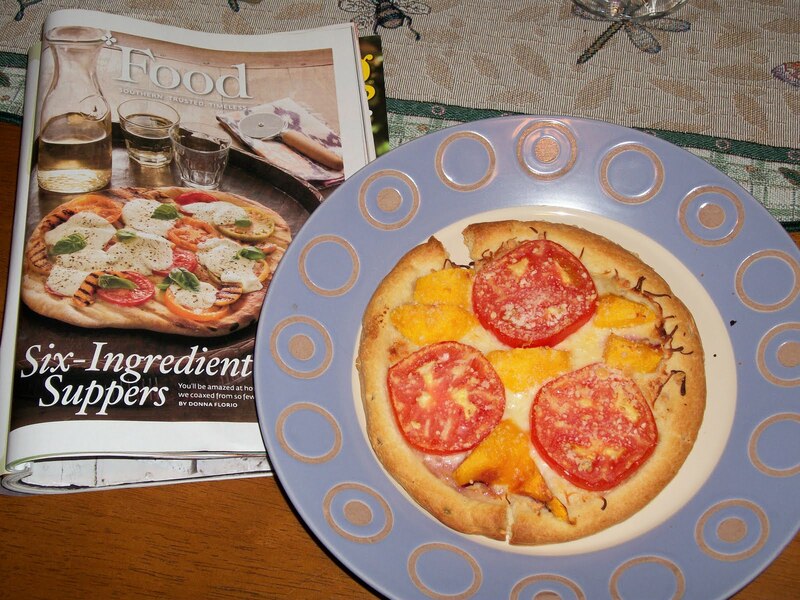 When I told my family and friends I made a tomato-peach pizza, many were like "What?!?" But the sweetness from the peaches blend really well with the cheese and the tomatoes. I highly recommend it! Preheat oven to 350 (or if you are using premade pizza crust, use the directions for baking on the package, my package actually said 425). Sprinkle tomatoes with salt and let stand for 15 minutes. Place pizza crust on a baking sheet or pizza stone. Brush with olive oil. Layer cheese, and then arrange tomatoes and peach slices as you desire. I then added some parmesan cheese on top of the peaches/tomatoes just for a little added kick. Bake pizza for about 12 - 15 mins or until golden brown (once again, check your premade pizza package directions).